August is almost drawing to a close and it’s been a good month. We’ve completed Phase One of the GftA-funded project with the Promoters Network. We’ve hosted two day-long sessions of sessions with expert speakers and addressed key issues including fundraising, education, marketing and audience development. The feedback has been good and now it’s time to use that feedback to plan Phase Two, to take place in the autumn. We’ve finalised our Autumn season for Jazz at HEART and we have some lovely gigs coming up between now and Christmas. Apollo has a number of things in the pipeline, including our first Apollo Collaboration taking place on October 12th at HEART in Leeds. This will feature guitarist Stuart McCallum, pianist David Austin-Grey plus some great Leeds musicians. Our vision to expand Apollo into the USA is starting to become reality, with 2 US exchanges in the pipeline – one to take place in May 2014 and another later in the year. I am so excited to meet with both of these bands when we travel to NYC and Washington in just under 3 months (!) and discuss what happens next. Speaking of US, we’ve booked our flights and leave for NYC on November 26th. It’s now time to get writing, as we’ll be recording all original material at the studio, by myself, Riley and Leah. Can’t wait to play with Leah again! 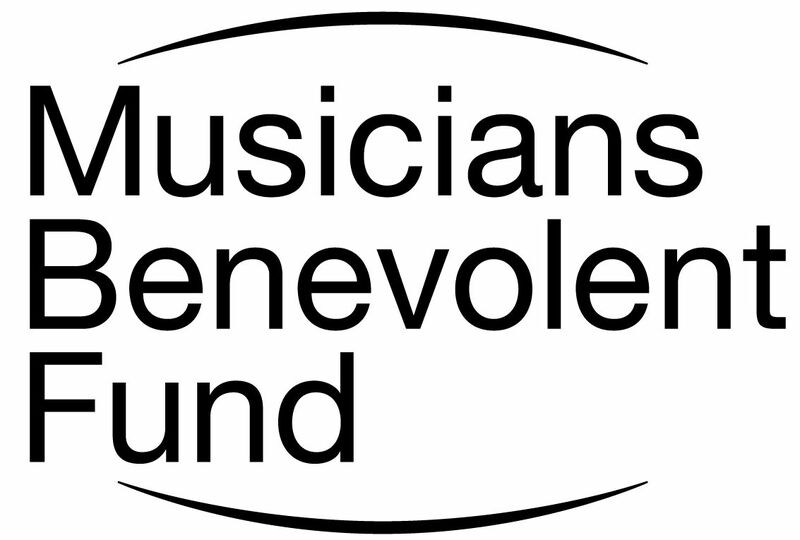 I’m so excited to be able to announce that I’ve won an Emerging Excellence Award from the Musicians Benevolent Fund. I am using the award to fund a trip to the USA in late November, where I’ll be studying with one of my musical heroes, Ingrid Jensen. Aside from studying with Ingrid, I will also be going into the studio with Leah Gough-Cooper and Riley Stone-Lonergan to record some original material written by all of us. Then I’m heading to Washington to meet with my Apollo partner Ken Avis to start making plans for our US/UK gig exchanges programme and look at how we can broaden Apollo to include not only UK jazz musicians, but US ones too. This comes at the perfect time – being able to keep the momentum going from the LOCUS tour is great and we’ll have time to plan our next LOCUS move. To have the opportunity to record my own music at an NYC studio with some wonderful musicians is fantastic and I can’t wait to hang out with Ingrid Jensen! My sincere thanks go to MBF and the panel that I presented to a few weeks ago. This is just the start…! 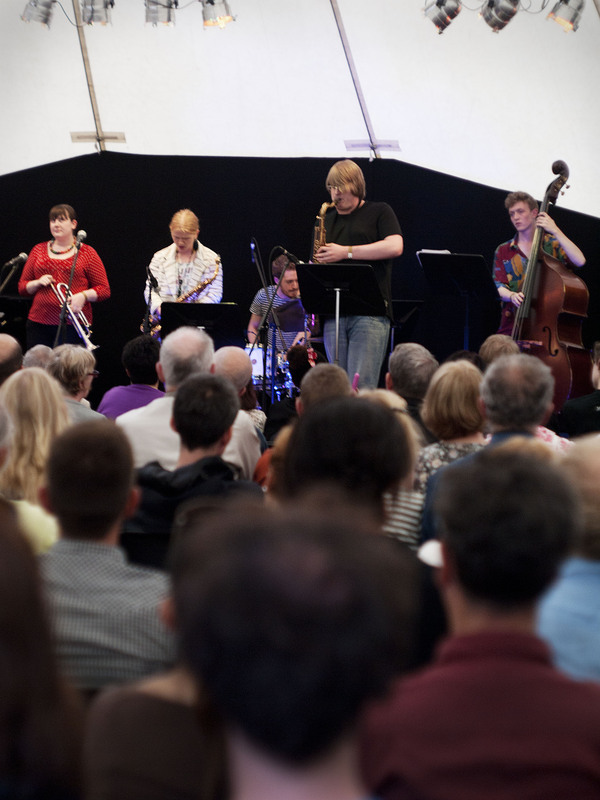 Thanks to Robert Beard at Jazzwise for this review of our Manchester Jazz festival appearance. Read full article. Trumpeter Kim Macari’s Locus featured inspired and thoughtful playing by the leader and saxophonist Leah Gough-Cooper, proving sensitivity is always better than the glazed-eyed thrashing of a Benoit or frenzied whoop-it-up of Fresh Dixie. The evening session at RNCM with a pan-European selection of leading younger players including the UK’s Arun Ghosh on clarinet and Chris Sharkey on guitar gave an insight into just how strong the European scene continues to be. Courtesy of the Take Five Europe project (an extended residential, meeting and learning opportunity for high flyers) the resulting band had numerous individual styles and qualities, as did much of their material. The discovery lesson of the day was that it is highly focussed musicians like Kim and Leah who should be in line for similar opportunities a couple of years from now. Thanks to Rachel Maby for these kind words about LOCUS! Monday saw a performance from the newly emerged ‘Locus’ band, brought together by Kim Macari and featuring alto-saxophonist Leah Gough-Cooper’s compositions. Having met 10 years ago playing for the National Youth Jazz orchestra of Scotland, the two have beautifully musically crafted this sextet. Leah’s through-compositions combine spacious discordant harmonies channelled through fugue-like weaving horn lines. Kim’s soft touch and Leah’s sonorous playing, coupled with the raw and electric playing of tenor-saxophonist Riley Stone-Lonergan brought together the ideal front line. See more of Rachel’s writing HERE. It’s been a couple of days since we finished the LOCUS tour and had some time to catch up on sleep, emails and reflect on the last 10 days and 6 gigs. Leah and I first started talking about setting something up before Christmas last year. We first met 10 years ago, and since then we’ve lived on opposite sides of the Atlantic ocean, both leaving Scotland to study jazz degrees, both working professionally as musicians (for all that entails – writing, performing, leading projects, teaching…). We planned the tour between us over emails and calls and though that sounds like a recipe for stress, it was a very smooth operation as tour-building goes! I realised before the tour had started that I’d found another musician I really enjoyed working with as a co-leader, and that is a rare and lovely feeling. We took a risk with LOCUS. We put together a band which worked on paper and hoped for the best. The rhythm section lives in London, two horns in Leeds and one in NYC – that renders rehearsal basically impossible. We decided to do completely original material written especially for the tour, meaning none of us knew the music. 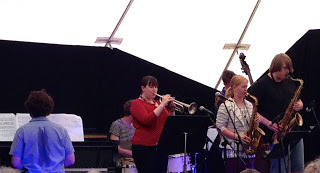 Then we set off on a 6 date tour which included gigs at jazz venues across the UK and two high-profile jazz festival dates. The lesson I learnt was this – trust your instincts and your creative vision; some risks pay off. Working with LOCUS was one of the most creatively fulfilling projects of my career. Working with 5 musicians who are talented and hard-working pushes you to play at your best and the feeling you feel when each gig feels better than the last is very special. I’d always cautiously hoped that LOCUS would exist longer than this tour, and by our second gig (at Edinburgh Jazz Festival) I was sure that it would. There are many people I’d like to thank and there isn’t always time at gigs, so I want to take this opportunity to do so. To Andy at the Verdict, Bill Kyle and Assembly Direct at Edinburgh Jazz Festival, Jez Matthews at The Lescar, the team at Olivers, Lesley Jeffries at HEART and Steve Mead at Manchester Jazz Festival. – thanks to you all for hosting our gigs, promoting us and giving us a chance to play this music together. To the audiences who came to our gigs and our family and friends who made the journey to watch us – THANK YOU. Seeing full audiences at our gigs was wonderful. To Martin Powell – thank you for the airplay on your show in the lead-up to the tour, and for the unfaltering support you give to us! To Riley, Sam, Jay and Tom – THANK YOU all most of all. You gave everything on each gig and I’m so pleased to share the stage with you. Aside from the gigs, you’re all great to spend time with – 6 people on 6 gigs over 10 days and who knows how many miles and I could’ve done all again many times over. And Jay – thank you so much for your driving. You drove so many miles and still played incredibly on the gigs. You’re a hero! And to Leah – co-leading a group with you is an absolute pleasure. I cannot wait to work with you again – this is only the beginning. Your compositions are wonderful and you sound great.